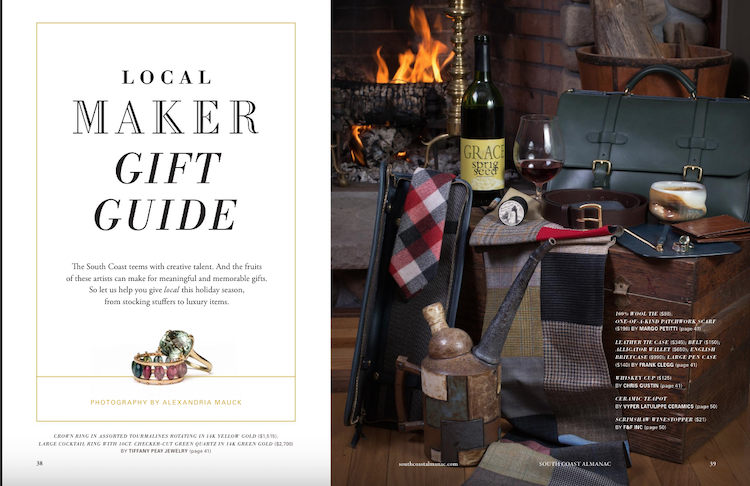 With one week to go until Christmas, we’re sharing the Local Maker Gift Guide from our Fall/Holiday issue. 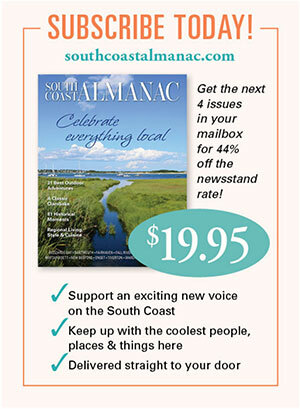 Scroll through to get some ideas and to meet some of the many talented artisans who call the South Coast home. Click here to get the goods, beautifully photographed by Westport’s Ali Mauck. If you want our Fall/Holiday issue in living color, have it delivered right to your door by buying it right here! This entry was posted in Holidays, Shopping, Uncategorized and tagged in Charlie Barmonde, Chris Gustin, Design Works Studio, Dorothy Cox, Elias Studio Glass, Frank Clegg Leatherworks, Harmony Winters, Jonathon's Sprouts, Lita Sea Glass Jewelry, Lynne Farrell, Margo Petitti, Natalie Squilant, Nilsa's Tea Botanicals, Salt Marsh Pottery, Tiffany Peay Jewelry, Vyper Latulippe, Wayne Fuerst. « Resolution: Do More Things!